Jam Drops are one of those old-fashioned biscuits that everyone loves. 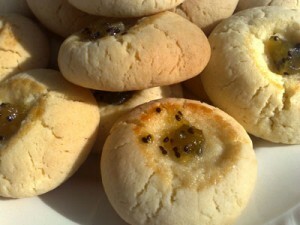 They are a beautiful buttery biscuit with a dollop of jam in the middle. There are many versions of Jam Drops but this recipe is my favourite as it consists of only a few staple ingredients and is super simple to make. You can use whatever jam is on hand – for my last batch I used Kiwifruit Microwave Jam. Remember, when the biscuits come out of the oven, they will be soft but harden on standing. Preheat oven to 180C (360F). Grease baking trays and line with baking paper. Combine the butter, vanilla and sugar in a mixing bowl and cream together until light and fluffy. Add the egg and beat well. Gradually stir in the sifted flour and mix to a stiff paste. Roll tablespoons of the mixture into balls and place about 5cm apart on prepared trays. Using the end of a wooden spoon that has been dipped in flour, press a hollow into the centre of each biscuit. Fill the hole with a little jam. Bake biscuits for 12-15 minutes, or until golden brown. Cool on the trays. What would be your favourite jam for this recipe? Please share it in the comments below. I’ve never tried Jam Drops with kiwi. Beautiful. Kiwi jam is a great idea, so cute! Raspberry is my fave but kiwi sounds great! I remember these. They were so much fun to make!